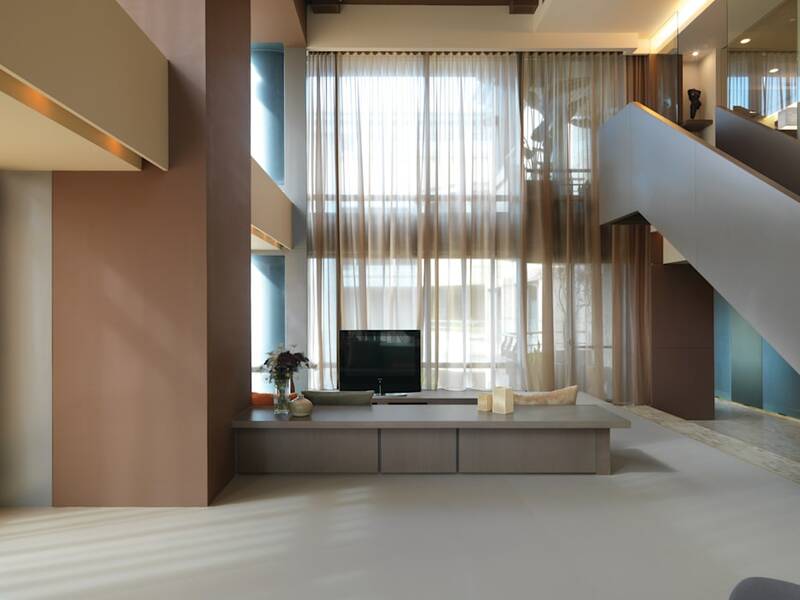 This is a duplex penthouse apartment in the heart of Taipei. The clients requested a design that would focused primarily on their nine months old twins. Child safety and comfort was of major concern. While their functional concerns were taken into account, there were two issues that defined the project. The first was the design of the stair element that connected the two floors. The stair placement and design evolved through many iterations. The placement of the stair needed to be spatially efficient and space defining. The final placement of the stair allowed it to be a divider between the entry foyer and the main living space with wrap around view. The design of the stair begun as a light steel and glass version, though not very child friendly. The final stair is essentially a tube with solid rails that took care of safety issues, while becoming a strong design element. The second defining design issue of the project was color. The client wanted to get away from the grey/white minimal aesthetic of their previous house. A more sophisticated design solution was required. By accident, we stumbled upon a painting by Le Corbusier, ------. The painting is filled with rich pastel hues. It became important to us as a way to create a color palette for the project. And through this use of color, we were able to find a new aesthetic. We developed a four color scheme of beige, dark beige, taupe, and brown. Different materials were assigned to the each color to create a rich combination of textures. Belonging to each color palette would be materials as diverse as spray paint, Formica, stone tiles, cork board, ..etc. The lexicon of colors and textures is to code walls, floors, and ceilings as abstract planes. Spatial qualities such as enclosure, separation and extension could then be expressed through colors.